The Route 1 bridge over Interstate 95 by Exit 9, about a third of a mile from Darien, will be shut down for two weekends in either June or July of next summer, state transportation officials told Stamford and Darien officials last week. For those who would normally go over the bridge, there will be a detour starting at Hamilton Avenue — the first right turn for anyone driving from Darien on Route 1. 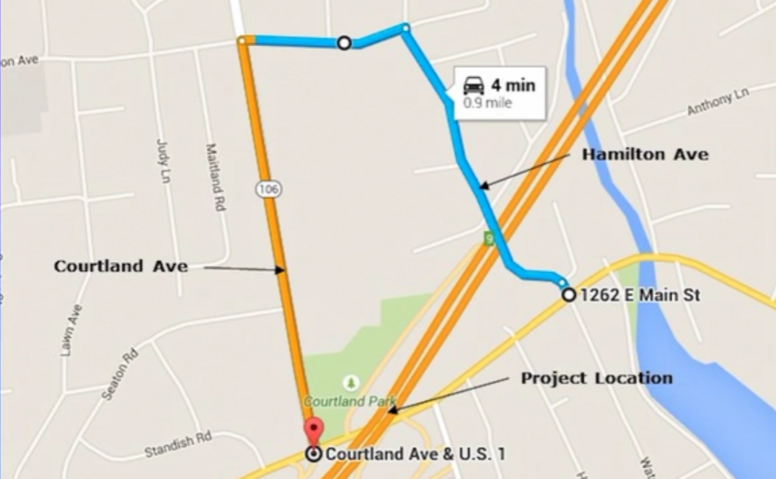 A couple of turns later, drivers can turn onto Courtland Avenue to get back to Route 1. For anyone on the highway, the Exit 9 off ramps will be turned into two-lane temporary detours. 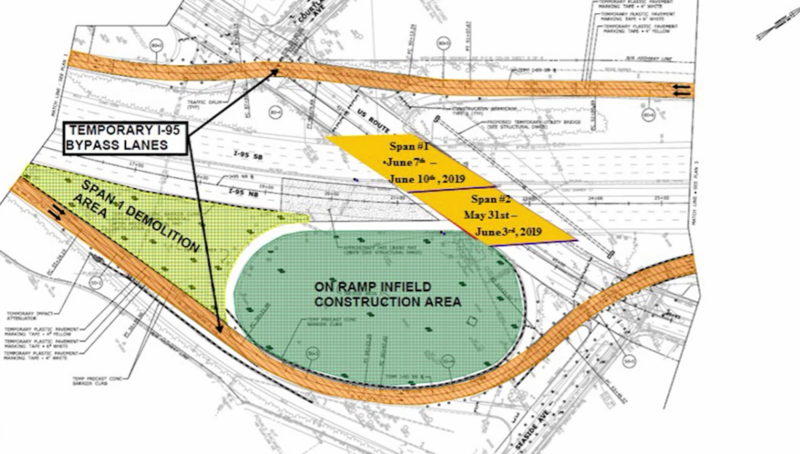 Southbound highway traffic will then take the on-ramp back to the highway. On the Northbound-traffic side, a temporary roadway will be built for the two-weekend detour. 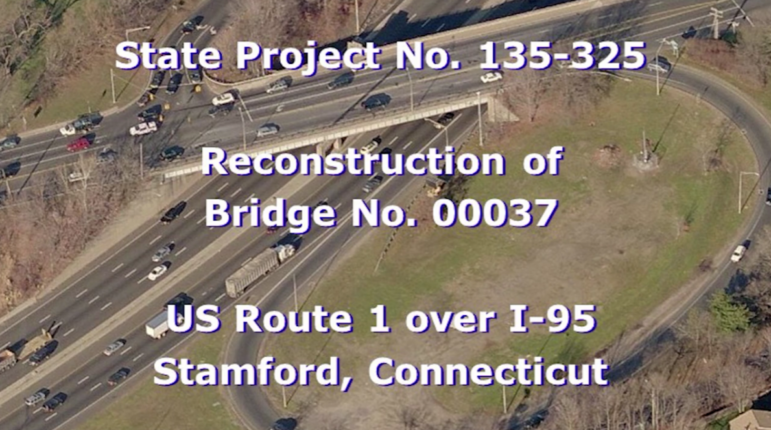 The Transporation Department has a schedule for the shutdown, although the exact date may change because of other work on the highway in Stamford, where a bridge near the Stamford Railroad Station is also being replaced at about the same time. The Exit 9 bridge isn’t supposed to shut down after June 28 or before July 25. Whichever weekends are chosen, the project is expected to be complete by the end of November 2019, a DOT official said. For whatever weekends are chosen, lanes would be closed starting at 10 p.m., Friday. Work would continue overnight, through Saturday and overnight Saturday to Sunday. Penalties — which Pelletier called “disincentives” — would go into effect if the bridge is not ready for traffic, above and below, in each direction, by 5 a.m., Monday. Those penalties can cost the contractor $85,000 to $86,000 an hour. No long-term lane closures are planned for the project, just “occasional off-peak lane closures for preliminary work,” a DOT official said. The two-weekend shutdown is in marked contrast with the three years of lane closures expected as the nearby Noroton River Bridge undergoes a three-year replacement project. “We call them ‘crawlers’ in the field,” a DOT official said. Local officials were shown pictures of the PMTs from a recent project in Southington. The two units will be constructed in the months before the move. Preparation of the oval grassy space appears to have begun already, with construction trucks at the site. This aerial view shows the bridge and the oval where the bridge units will be built before being moved into place. Map of the project, showing the new spans, the oval and temporary bypass lanes. Ignore the dates on the spans: Those and other minor changes were made since the image was created, ConnDOT officials said. SPMT or "crawler" putting part of a bridge in place in a similar project. The two-weekend detour for drivers wanting to get from one side to the other. The pedestrian bypass, if you must walk. It takes you back to Route 1 at McDonald's on East Main Street. It may or may not give you a good view of the construction. When built, the bridge blocks will be something of a temporary landmark. 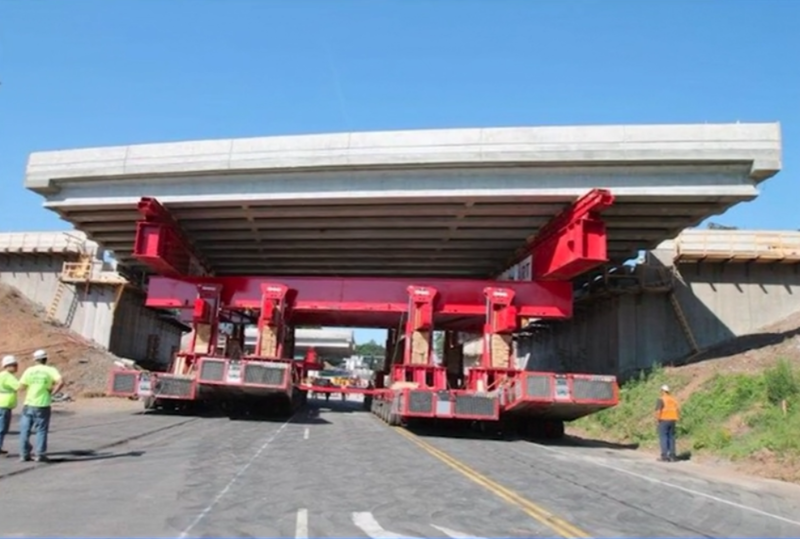 Connecticut Department of Transportation officials expect the sight to help make the public aware of the weekend traffic disruption to come. Department officials will try to alert drivers as far away as New Jersey that the project will delay highway traffic — with only two lanes on the temporary highway detours — for two weekends and that other routes may be quicker. The demolition and replacement of each half of the bridge in turn should be completed between the time commuters drive home Friday evening and when they again go over the bridge to work on Monday morning. The weekend shutdowns are the only lane closures DOT officials described in the June meeting with Stamford and Darien officials, as recorded in a Darien TV-79 video (see the video below). The replacement project will completely block the six regular north and south lanes on I-95 for those two summer weekends, but the highway won’t be shut down. Instead, on the southbound-traffic side, temporary highway lanes will be built entirely along the traffic exit and across Route 1 to the southbound entrance to the highway. No one will be allowed to leave or enter the highway at Exit 9, however — Jersey barriers will prevent that. Transportation officials called the temporary lanes “flyover lanes,” but they’ll be right on the ground. Jersey barriers will prevent vehicles from turning onto Route 1, and vehicles on Rt. 1 from getting on the highway there. For northbound-lane traffic, the temporary bypass will follow the exit ramp, then turn left to the north and cross Route 1 at the intersection of Seaview Avenue and the Post Road. 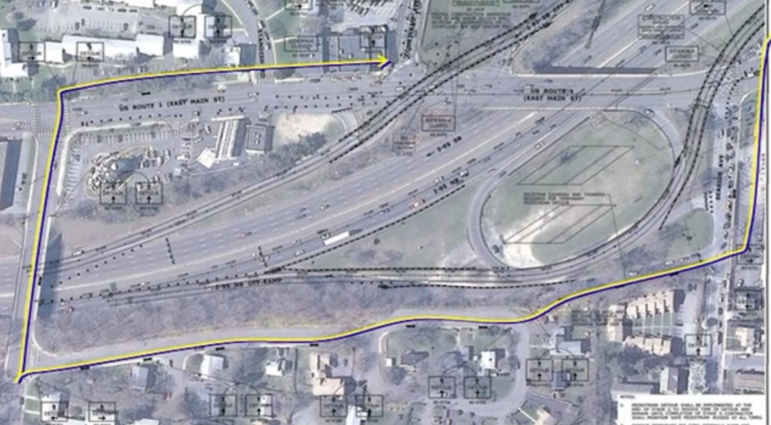 It would then continue north, over the now-grassy embankment that slopes down to the highway. Drivers on local roads wanting to get from one side of the highway to the other will need to use Hamilton Avenue, not far from the Darien border. Farther north, that street is about a block away from Courtland Avenue in Stamford, which can then return a driver to Route 1. After the two weekends of blocked routes, traffic will again be allowed on the bridge and under it. 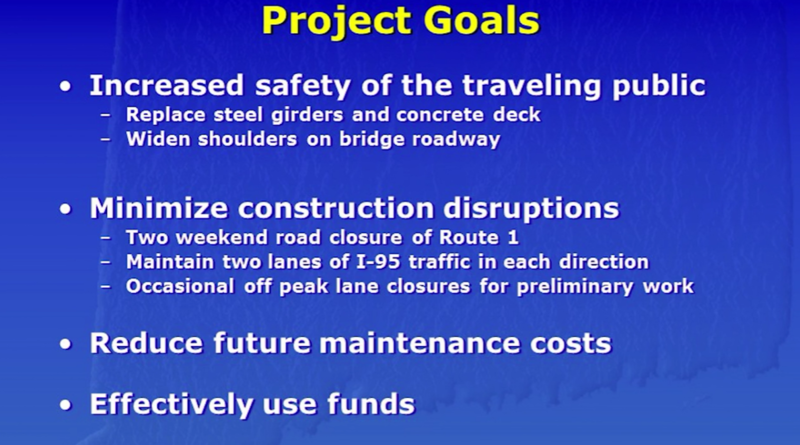 The entire cost of the project is budgeted at almost $15 million. 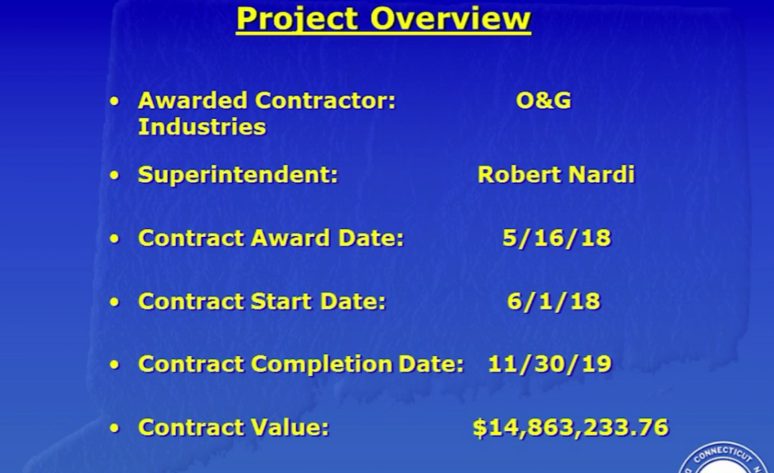 The contract has been awarded to O&G Industries, which is on a schedule that will allow it to get bonus payments if the work is completed on time or early. If the project is late, however, even by hours, OG effectively will be penalized by getting smaller payments. ConnDOT officials think each weekend’s project will be completed before Sunday night. No long-term lane closures are expected with the project. The Transportation Department has a bridge numbering system. The bridge at Exit 9 — Number “00037” — was built when the highway was constructed in 1958 and never replaced. “Those bridges were designed to last 50 years, and right now we’re at 60 years,” Pelletier said. Bridges are rated for safety on a scale between 1 (worst) and 9 (absolute best, often new). As old as it is, Bridge 37 is rated 4. The abutments at either side of the bridge and the central pier between the highway lanes for northbound and southbound traffic are not being replaced. Fences 5.5 feet high will be put above the parapets on each side of the bridge. Here’s a Darien TV-79 video of the June 12 meeting. CDOT Meeting – Route 1 Bridge Update from Darien TV79 on Vimeo. 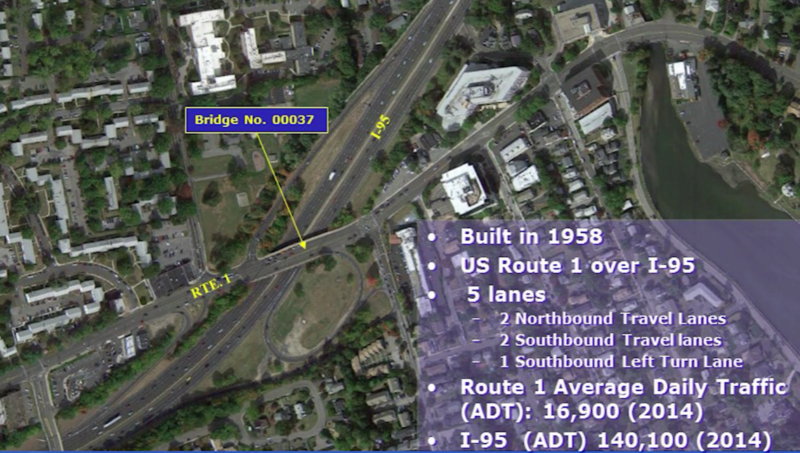 Expect lane closures on Interstate 95 near the Exit 9 bridge starting Monday and continuing for some unannounced time during weeknights (and overnight), the Connecticut Department of Transportation announced. "The regular work schedule for this project," which may be changed if ConnDOT thinks it's necessary, is from 8 p.m. to 5 a.m. In other words, expect lane closures starting at 8 p.m., Monday nights and through Thursday evenings (ending by 5 a.m., Fridays) — every weeknight except Friday nights.